We decided last minute to take Carlee (and Eli) to Tulsa to the zoo and aquarium Thursday and Friday...and it was quite a trip. In case you're wondering, the sleeping 5 consecutive hours and the non-screaming night did not last more than that one joyous night. Eli is back to his old self...in fact, he's crying right now. But my WONDERFUL mom is rocking him. So, back to the zoo and aquarium...We packed up and left early Thursday morning and headed to the aquarium first - Carlee was super excited. I'm not sure it was worth the $$ for Chris and I, but she thought it was great. We planned on taking her to Incredible Pizza that night - but Eli did not agree, so he and his daddy stayed home and Carlee and I ventured to Chuck E. Cheese to play games. I kind of feel like I need to disinfect when I get back from that place...too many germs! But, she had a great time. On the way home we stopped at Chili's to pick up dinner. When we walked in the door the guy at the cash register greeted us...to which Carlee replied (with a giggle) "hey mommy, that boy has a pony tail...boy's don't have pony tails". I covered her mouth and the guy acted like he didn't hear her. I tried to stifle my giggles while I was waiting for my receipt, but it sure was hard. Living with a 3 year old brings funny times! Even though it was a crazy trip, it was priceless. As we were driving I looked in the back seat and it hit me that I really have two kids. I spent a lot of time thinking about the future and what trips like this are going to be like when they are a little bit older. Carlee spilled over with excitement with everything that we did...I love that! Now, if I can find my camera, I'll post some pictures. Today Eli and I were sitting out on the back porch feviershly rocking and I had to laugh at myself. I was thinking about all of the people I have talked to in the past few days and remembering the conversations - they all revolved around me and they all were a detailed rendition of Eli's sleeping schedule the prior day. I went step by step through every hour of eating, waking and sleeping. I talk about it as if people really care to have all of that detail. It's funny to look back at all of my posts only to see that most are the same. It's what I live right now. Hour by hour, watching the clock to see when it's time to eat, sleep and wake. Now that I'm in the middle of it again, I remember a little of what this was like with Carlee. But, now I just put her to bed - we read a book and sang Jesus Loves Me and a couple of other songs, I kissed her good night and told her I would come back in and check on her...that was it. No screams, no rocking, no troubles...and just 3 short years ago I was watching the clock for eating, waking and sleeping with her. By-the-way...Saturday night Eli slept from 11:30 p.m. to 6:00 a.m. Of course it was a night that mom was getting up with him, so I didn't get to experience the joy until the next morning. Last night he went until 4 a.m., which was still pretty good. We'll see how he does tonight. Tomorrow he'll be 6 weeks old. I started reading a book last night but I'm not sure why. First, I'm going to end up staying up later since the only time I have to read is after the kids go to bed. Second, and probably the biggest reason is because of what the book is about. It's called 90 Minutes in Heaven. I went to WalMart last night to get formula (we're going to try Lacto-free and see if that helps), while I was there I thought I'd run over to the books to see if I could find a magazine with window treatments...since all I think about these days is formula and decorating. I didn't find a magazine, but my eye immediately went to this book. I am drawn to anything about Heaven. Right after the reality of my dad's death hit me I began searching through the Bible to find descriptions of Heaven. For some reason I needed a description of what it was like. I wanted to know that he was being taken care of and that he wasn't scared. I've been taught all of my life that Heaven is a wonderful place. But, it never really mattered what it was actually like until then. So, I picked up this book and read the back. It told of a man whose car had been hit head on by a semi. Paramedics said he died instantly. The man experienced heaven. 90 minutes after the wreck, while a minister prayed for him, the man came back to life. This book was his story. So, I'm reading it with a tad of unbelief. I want to believe that all things are possible with God. I'm just a little leery about whether God would bring someone back to life...I know he did in biblical times, but now? Is this real? I'm reading his description of Heaven and I want to believe it, but I'm not sure. I prayed when I knew my mom and dad had been in the wreck but he didn't come back to life. I'm certain other people have prayed for the people they love when death has arrived, but you just don't hear of people coming back to life after 90 minutes of being dead...and being OK enough to write a book and tell about what Heaven was like. Reading the acknowledgements I see that he was and is a member of a Baptist Church. The preacher who crawled into the car to pray for the dead man was also a Baptist minister. So, they're not some kind of crazy religious faction...they're people just like me (well, kind of). Several paramedics announced him dead. They covered him with a tarp...It seems like I should believe it. So, I'm praying that God will give me discernment, and I'm going to finish reading the book. The description of Heaven sounds wonderful! I felt like angles were singing when I woke up at 3 this morning to Eli's grunts...why so happy? Because his last bottle was at 9:30! He went for 5 1/2 hours between bottles!! Granted, it was 10:45 before he went to sleep, but still - that was approximately 4 hours of uninturrupted sleep! We were back in bed by 3:45 and at 6:18 a.m. he's still asleep...grunting a lot, but asleep. After switching him back to Gentlease with the drops, it seems like his belly feels a lot better. No more projectile poops in the middle of the night (or any time for that matter). Yesterday I layed him on the couch and talked to him for about 10 minutes...he was bright-eyed, just studying my face and moving his hands around to try to touch me. It was wonderful! We haven't gotten to have that kind of interaction yet becuase he's been so fussy. Normally, if he's not sleeping, he's screaming. So, I spend all of my time trying to rock him back to sleep - since that's when he seems most at peace (and I get a break from the crying). So, here's hoping that this is coming to an end. If it ends at 6 weeks, I'll count myself extremely blessed. Most people have to endure it for 3 months! 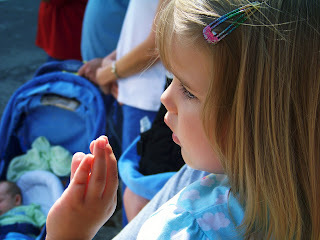 Here are pictures of Carlee at the Old Fort Days parade. She LOVES horses and princesses right now, so this was amazing to her...cowgirl's with fancy clothes and crowns and LOTS of horses. She just sat on her daddy's shoulders and waved in a daze for about an hour. And, the house. We're getting close to finished. This is before they cleared the land...now it actually looks like a yard - but without grass. They should be getting a lot done this week. Hardwoods go in next week and that's the last inside thing. They'll still put cedar posts on the front porch, add shutters and stain the door, shutters and posts...that will be the last outside thing and should happen next week too! Um...remember how I forcasted that Eli would sleep all day since he was up all night? Was I ever wrong. Instead he has screamed all day. For the last couple of days his poops have been a bright blue-green color (I know, too much information). He's fine while he's eating - eats about 3 oz. and quits (I put 4 in the bottle, but he rarely finishes) about an hour after he eats he starts screaming and putting his fists in his mouth like he's starving. So, I called his pediatrician again today. They probably think I'm crazy! Now, she wants me to keep using the drops and put him back on Gentlease. She thinks the other is (in the nurses words) "tearing up" his stomach...hence the blue-green poop. So, I'm going to watch the re-run of Army Wives and my husband is graciously going to give me a break for a while. I'm just writing so that months from now I can look back and remember how tired I am today...and I'll be thankful that we conquered sleep deprivation. Eli had a bad night last night. I'm sure he'll sleep most of the day today - that's kind of his pattern when he has a bad night. My plan was to send Carlee to school to play with her friends today and "nap when he naps" like all of the books tell you to do. Chris was about 2 minutes away from the daycare when they called to tell me they have to close because of a power outage and leaks...bad storm last night. So, she's back home with me and we're eating a banana and watching Clifford. I have a feeling she's going to watch too many cartoons today. And...he's crying again, so off to rock. It's 3 a.m. and I'm feeding my precious baby boy. Thankful today for a wonderful husband who is committed to raising him to be a respectful, loving, kind man. Chris is the type of father that I prayed about for my children. Thank you Chris for being such an amazing dad! You are helping to mold both of them into wonderful people. Ever since my dad died, father's day has been such a sad day for me. My dad wasn't always a super dad (I'm certain he would agree). It's not that he didn't love us, he was just never taught to show us that he loved us. It wasn't until my nephews were born that love began pouring out of him. They helped him figure it out! My grandpa though...he knew how to show love (my mom's dad). He was my picutre of what a daddy should be to their little girl early on. He was very kind, loving, gentle. I loved sitting on my papaw's lap and rubbing his head...he had a flat-top that felt really cool! He died 7 years ago last week. A year before my dad. I remember sitting at his funeral and my dad being really sad for us. He hugged me a lot that day. The father's day after my dad died, I felt a signifigant sense of loss. It felt like everyone else had a dad, a grandpa, a father to their children. I had no reason to celebrate. It was just another day to me. The fact that it even existed made me a little mad. It makes my heart hurt for my mom because I know that she's still in those shoes...no dad, grandpa or even husband to her children to celebrate with today. She has no need to buy a father's day card. But, she celebrates with us and our husbands...loving that we chose wonderful dads for our kids. I'm also sad for my nephews today. Their mom and dad are divorced and their dad has chosen not to be part of their lives to avoid paying child support. I don't know which would be worse, a daddy who dies or a daddy who chooses not to be a part of your life. My dad was an amazing grandad to them. I'm sad that they don't have a dad or a grandad to celebrate with today. They should. Please pray for those who don't have a reason to celebrate today. Their hearts will certainly hurt when they see people loving on their dads and grandads. The loss they feel the rest of the year is magnified today. Chris, I'm so thankful that God put you in my life and made you the father of our children! You give me a reason to celebrate today! I normally don't like those little signs on Church marquees...We pass lots of them on our way to work every morning. I think they tend to make Christians sound a little hokey - "This church is prayer conditioned", "Tithe if you love Jesus, anyone can honk". If I wasn't already a church-goer, some of them would probably make me think twice about trying it out. But, when I was driving to Charleston last week I saw one in front of a little tiny church that stuck with me...it said "Bloom where you're planted". I love that. I often find myself waiting for the next big thing. I don't always enjoy and make the most of where I am because I'm anticipating when things are going to be different and get "better". Oh, if I could bloom where I'm planted. If I could be my best where ever God decides to plant me at the moment. That's my desire and my prayer. I write this not so that I can remember for the next time (because as far as I'm concerned there won't be a next time) but so that some day I can help some other disheveled mommy like my friends helped me yesterday...Thank you friends for reminding me that this is temporary (and for your tips)! Dealing with Eli's colic has been tough. Just like every other mom and dad who've had a baby with colic, I've tried everything I can think of. It starts precisely at 7 p.m. and lasts anywhere from 11 p.m. to all night...I prefer 11 p.m.! Last night he got temporary relief from laying on a pillow on Chris lap - that lasted about 5 min. but when you've got a screaming kid, 5 minutes of silence feels like an eternity. Standing in front of the dryer and bouncing worked temporarily too - whatever works! Last night I just wanted to watch Army Wives...my guilty pleasure for the summer. I always like to pick one "can't miss" show each season - and this is it for me. Sunday night 9:00 - shouldn't be too hard to work that into my schedule. Except for Chris was trying to get Carlee in bed and I was holding a screaming baby. I found myself telling him "Eli, mommy just wants to watch this show, then you can cry". Ridiculous, I know. And he didn't care. We're getting a DVR when we move. Anyways, since his next bottle was at 11, I put him in a warm bath at about 10:45 - which totally relaxes him - put him in his pj's, swaddled him (while he was screaming) and gave him a warm bottle with a little shot of Milacon in it. He tooted like crazy then finally relaxed and fell asleep right after his bottle. I put him in his bassinet, expecting that he would start screaming within minutes, like usual...but he didn't. I stayed awake for a while - not wanting to go to sleep just to be awakened with screams...but nothing. I checked his breathing...yep, still breathing. The next thing I knew I woke up to his grunts and it was 3:15!! He slept from 11:30 to 3:15! So, up for a warm bottle with another shot of Milacon and we were both back asleep by 4:00. Then, didn't hear a peep until 6:30. I feel like a new woman. Now...if we could just get rid of the screaming at 7. I have to say that Saturday night was a terrible night. I was so exhausted and just spent. But, when I was bouncing Eli up and down sometime around 4a.m., I couldn't get out of my mind all of my friends who have lost babies - either before they got to meet them or after, and I just kept thinking that they would give anything to be up at 4a.m. rocking their screaming baby. This is a season. I will praise my God for the wonderful blessing he has given me in Eli and Carlee. Yep, it's colic. His dr. changed our formula to Nutramigen...cha-ching. We may have to move to eating ramen noodles! We'll try it over the weekend, and if it doesn't get better, she's going to prescribe a medication. Because of the hydrocele issue, she doesn't want him crying so much - apparently when he cries, the straining pushes more fluid down there which could result in a hernia. Regardless of the hydrocele issue, I just don't want him to cry like that. Tonight has been much better. He's still fussy, but better. So, my wonderful mom is taking the night shift tonight so that Chris and I can sleep. Did I mention that she's wonderful? 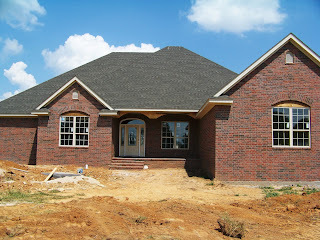 Our builder said today that we should be able to move in the first week in July. The tile looks super. Tomorrow they're doing the driveway/sidewalk and finishing up the tile. The more stuff they finish, the more anxious I get to move in. I just can't wait!! I'm on the lookout for someone who can make a My Little Pony birthday cake. Carlee is convinced that she HAS to have a My Little Pony party. So, if anyone knows someone who can make that happen, I'm taking suggestions! I found a cute cake online that I'm sure someone will be able to do for us. I'm off to get some shut eye. Love it! Oh, I was hoping that I would never have to look this word up...but last night, I found myself online trying to figure out what might possibly be wrong with my sweet little boy. From 7:30 to just after midnight he screamed. Not a "pick me up, I want to be cuddled" scream...a "something is hurting me" piercing scream. Nothing I tried comforted him. We sat down and rocked, stood up and bounced, faced him forward, put him on my shoulder, cradled him, tried the bouncy seat, the swing, the boppy...still screams. So, I read online about gripe water - drove to WalMart at 9:30 to see if they had any - none. When I got back he was still screaming and Chris was on the verge of tears. We wanted to be able to help him, but didn't know what to do. I put him in a warm bath and he relaxed enough to stop crying for a couple of minutes...relief. But, as soon as it stopped, it started back up. Was it colic? Has the fluid issue escalated into a hernia (which I read causes abdominal pain). Chris drove to Fort Smith at 11:00 to see if he could find an open pharmacy. After two closed Walgreen's stores, he finally found one that was open and bought the gripe water. In the meantime, I was researching to make sure it was safe to give this to him. It was all natural and did not contain alcohol, so everything said it was OK. While Chris was gone, he was at his worst, so I found myself in tears calling my mom to get an opinion on whether I should take him to the hospital (she spent the night with my sister last night). We both decided it was probably colic and sitting in the emergency room would just make things worse. Finally, at about 1 a.m. he calmed down and fell asleep - but woke up about every 30 minutes. I finally put him in the bed next to me and we both fell asleep at about 3 a.m. He seems to be doing better this morning. He's laying in my bed sleeping as we speak. I called his Dr. this morning and because of his "fluid" issue, they want to see him today.